All dry and wet storage tenants get to pump fuel into their Lake Conroe boats at substantial discounts from retail prices on the lake. Simply present your computer coded discount card when filing up with gasoline and diesel. Lower priced gas is just another benefit we provide our tenants to make your Lake Conroe Boating Experience better than “the guys across the lake”. Besides having the quickest and easiest access from the Houston Metropolitan area, the marina’s basin is 15-20 feet deep and surrounded by an earthen breakwater. High winds and waves or low lake levels won’t keep The Palm’s boaters off the Lake. 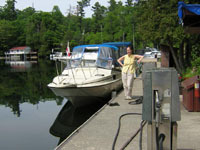 Neither will spiders or insects since an No More Spiders Repellant System has been installed throughout all floating docks.